Summer entertaining wins with Sumptuous Living's Mandy Landefeld! It's summertime and we're feeling fine! Sumptuous Living's Mandy Landefeld shared fresh recipes and cocktails perfect for summer entertaining! Grill out with family and friends! We're sharing how to serve a fabulous summer punch that thrills a crowd (with Mandy's tips for big batching your favorite single serve cocktail recipes), grilling recipes that are easy to prep and serve, and charming mason jar desserts. Every party starts with a great drink but it doesn't have to be hard! Make it in advance to keep things simple. Place 1/2 of the sliced peaches in a high power blender with 1 1/2 cup of the lemonade. Blend until perfectly smooth. In a large pitcher, mix remaining lemonade, bourbon, peach puree, peach slices, and mint. Stir and store in the fridge for 1 hour to overnight. When ready to serve, add club soda and stir. Serve over ice, garnished with mint and peaches. 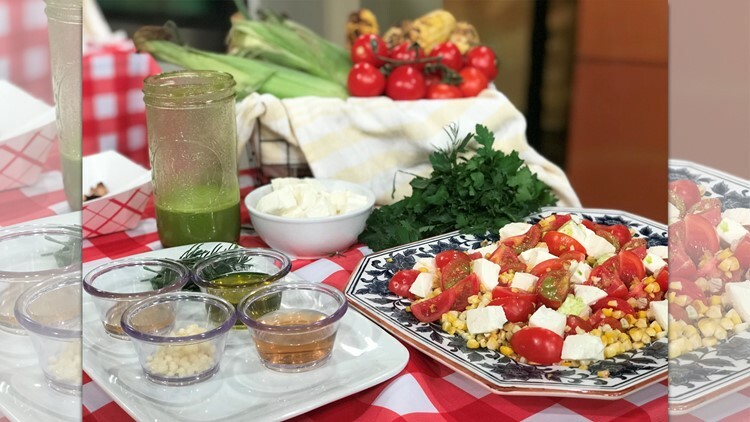 Grilled Corn &amp; Tomato Salad! Place all of the dressing ingredients into a blender and blend until smooth; set aside. Grill corn on grill pan or hot grill until lightly charred on all sides. Let cool; using a knife remove kernels. Place tomatoes, grilled corn and pearl mozzarella balls into a large bowl and stir slightly to combine. Lightly drizzle dressing to taste. 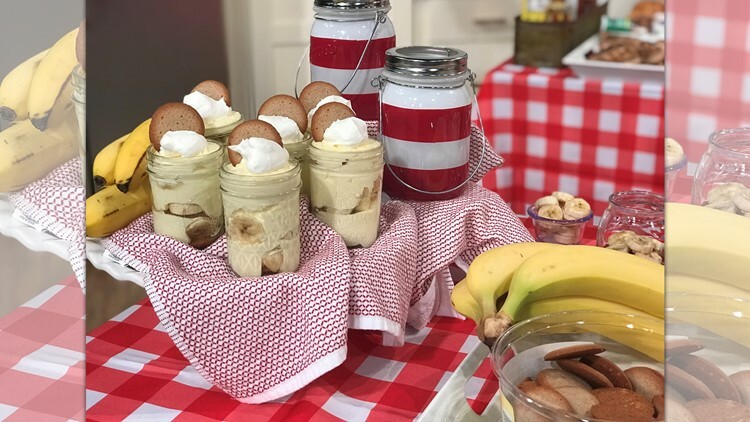 Make Dessert Easy and irresistibly cute by prepping them in mason jars ahead of time! Mix first 4 ingredients together in large bowl. In small mason jars, layer wafers, bananas, pudding mixture, and repeat. End with a final layer of pudding. Place lid on jars and chill until ready to serve.